They are able to deliver high-speed assemblies of multi-sized components on a far greater scale to meet customers’ increasingly demanding turnaround requirements. 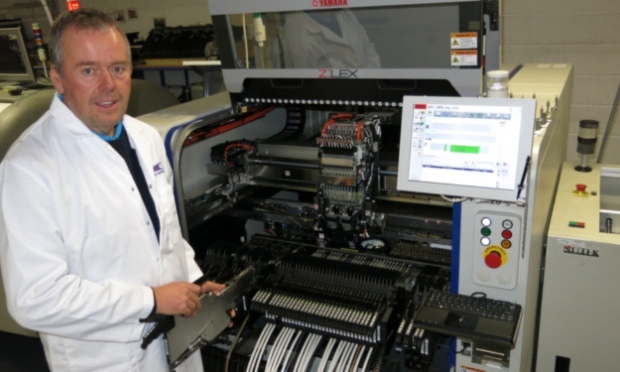 From miniaturised components to large assemblies, Key-Tech Electronic Systems is able to offer the electronic and electromechanical industry what it believes is leading-edge flexibility. The technology is considered to be the best in its class with operating mounting speeds of 90,000 chips per hour. With a built-in smart recognition system to reduce operator input, it can place unconventionally shaped components accurately and efficiently without compromising on quality. Finance director Jim Spence said the competitive advantage will serve Key-Tech well in the marketplace. The additional work the new equipment will bring in could create up to 10 more jobs. The company was created in 1993 by two former senior managers of the then Hughes Aircraft, now Raytheon, with just four employees. Now it has a workforce of almost 60 and an annual turnover of £5 million at its Mitchelston Industrial Estate base. Key-Tech Electronic Systems supplies both small, medium and high turnover clients within the oil and gas, subsea, nuclear, military, medical, security, scientific, industrial and retail markets. Mr Spence said: “The company started with a vision to fill identified gaps. “Today, just over 21 years later, we’ve organically grown the business to a level where we can comfortably meet the needs of major players in this industry. “Our strength, from the beginning, was always our unique ability to understand, create and design new processes for our clients.